ThinkUSAdairy.org is built for global buyers, foodservice professionals, food and beverage manufacturers. U.S. Dairy exports exceed $7 billion annually, and have enjoyed five consecutive record years of growth. Still, much of the world is still discovering U.S. dairy. Where can global buyers go to learn what our industry has to offer and to find U.S. suppliers selling the specific products they need? Developed by the U.S. 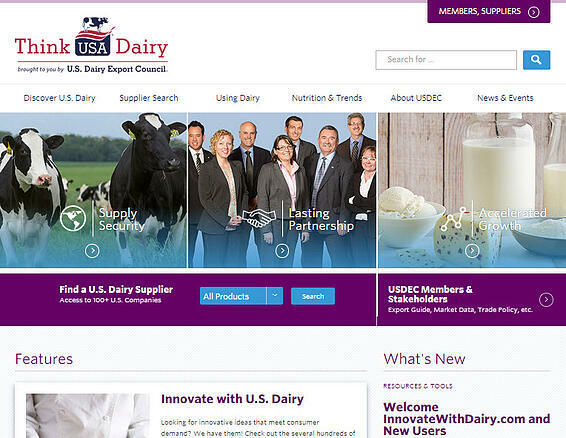 Dairy Export Council (USDEC), the site is tailored to the unique needs of global buyers, foodservice professionals as well as food and beverage manufacturers. Formulators and chefs alike can now keep up with ever-evolving trends and gain inspiration for using U.S. cheese and dairy ingredients in new and innovative ways. The new site replaces the domestic-focused InnovateWithDairy.com. Shares in-depth knowledge of the U.S. dairy industry and its broad portfolio of multifunctional ingredients. If global customers ask, "Why U.S. Dairy?," this new site provides answers.